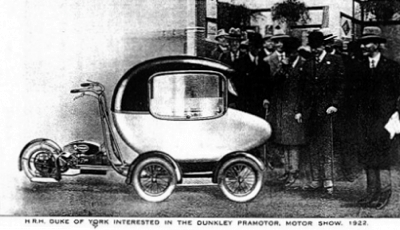 In 1923, Dunkley made the decision which was to earn them immortality: to produce a motor pram. The heart of this was a unit called the Pramotor, which was basically a scooter with the front' wheel missing. 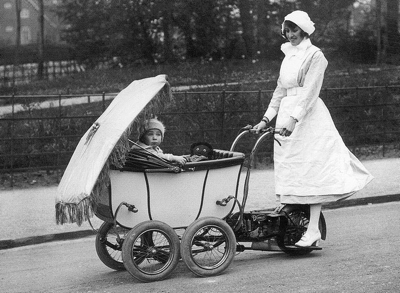 The one-wheeled power pack could be fastened to the rear of any Dunkley pram: Nanny stood astride the rear wheel, controlling the outfit's hectic progress with twin handlebars bolted to the back of the pram. Power units were originally all 1 hp, horizontal, single-cylinder two-strokes, with bore and stroke dimensions of 2 in x 2 in. There was only one gear (two-speed gearing appeared a year later), but there was a kick starter and a hand-controlled clutch. Prices ranged from 40 guineas. For sporting Nannies there was also the option of a 21 hp engine - a 750 cc two-stroke single - which at 75 guineas promised performance far beyond the roadholding capabilities of the average perambulator, as the Pramotors were prohibited by law from using public footpaths or parks. They had to mix it on the open road with more conventional, more controllable vehicles.